Yesterday I had a sew date with an old friend. Although we have always enjoyed talking about home and garden projects, it wasn’t until recently when I started quilting that we decided it would be fun to actually get together and sew. As I had the recently equipped sewing studio and I hadn’t had her over in a long time, we decided to do the sew date at my place. 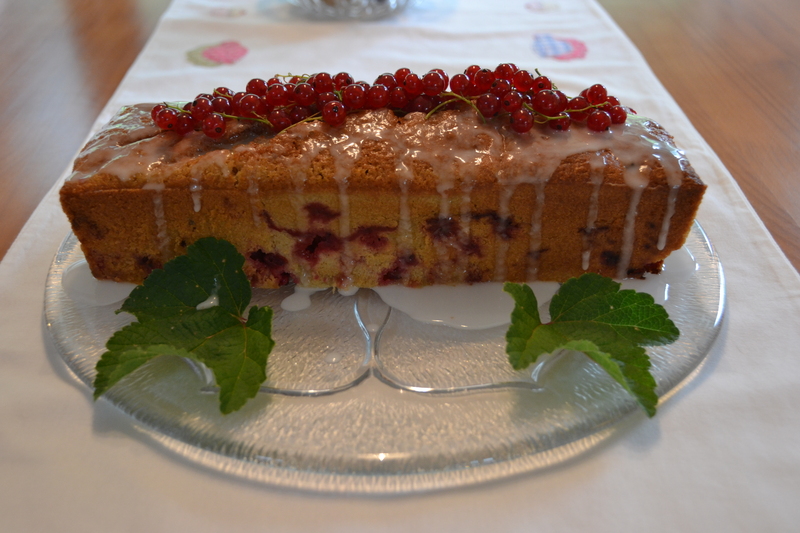 For lunch, I cooked up a nice casserole and baked and blogged about this Earl Grey Tea and Red Currant Loaf Cake, which I had loved. You can get the recipe from this blog (which has it kindly translated in to English at the bottom of the post) here . 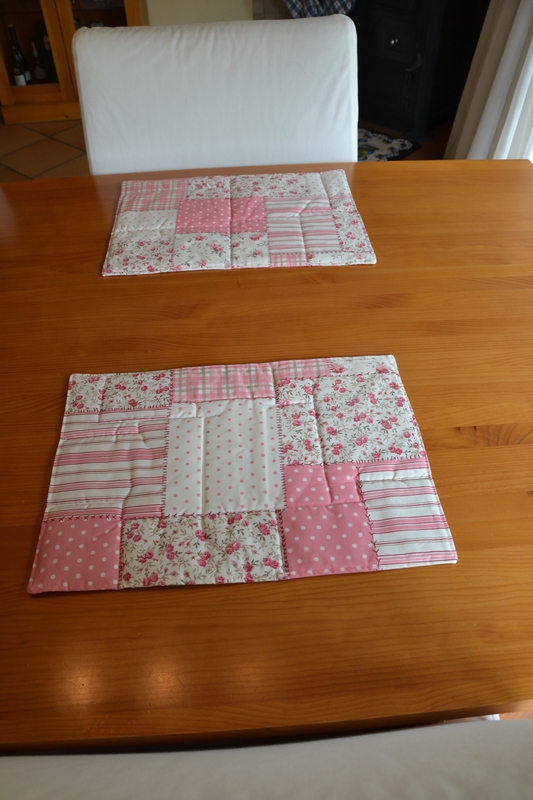 My friend, has a lot of sewing experience (mainly garments, home décor pieces and crafts) but she had never tried making quilts before and when I told her I had started quilting, she was immediately interested and wanted to try her hand at this craft. The day before she came, she even made her own quilted placement using this beautiful home décor fabric, which came out really well. I was impressed and even more thrilled when I received two as a hostess gift. 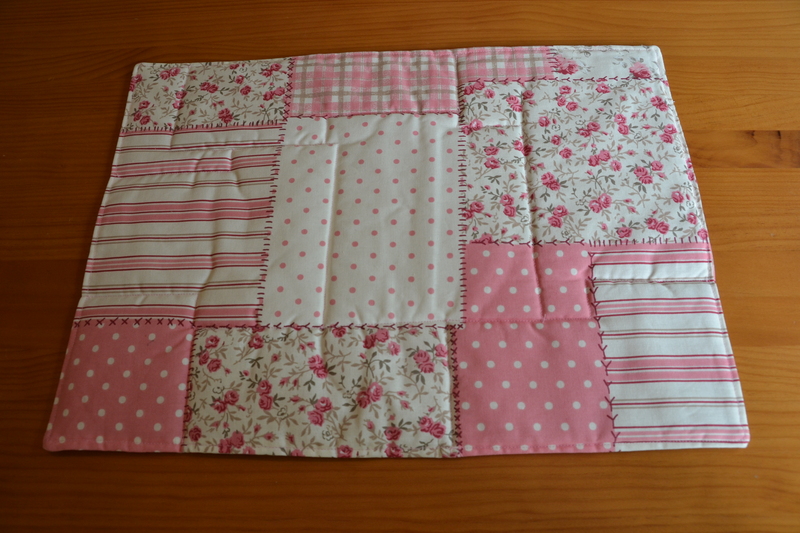 But now onto the sewing and quilt making we did on our sewing date. 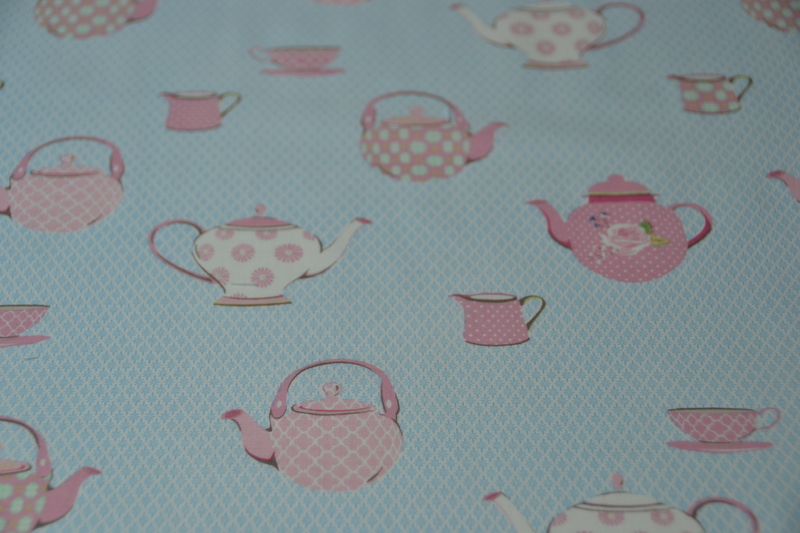 My friend had bought this lovely Gütermann fabric from their Ring a Roses line at Karstadt in Konstanz, Germany in two coordinating colors. You can go to the Gütermann’s website here. 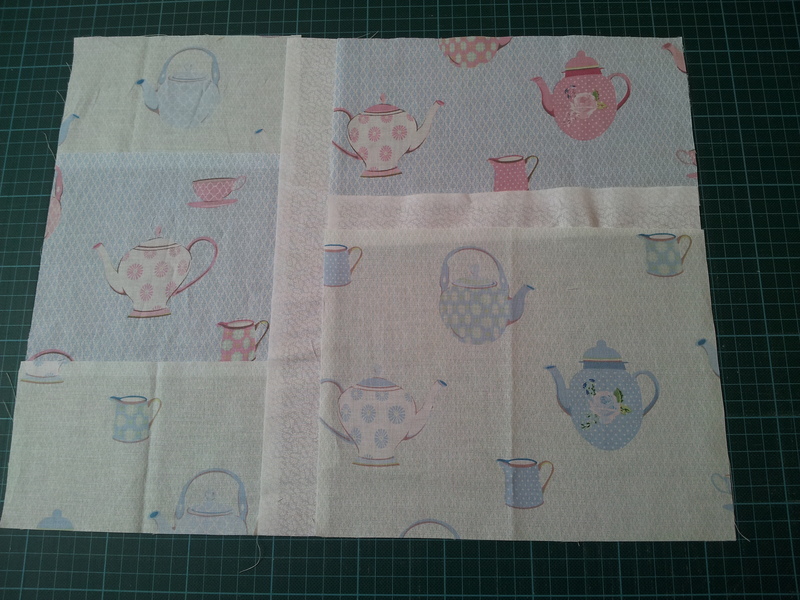 Together with some white border scraps she created her own design. I enjoyed introducing her to the rotary cutter, though I admit I wasn’t the best teacher, but then this first sewing date was more about enjoying a little sewing company and introducing my friend to quilting in general, than actually teaching her how to make a quilt. 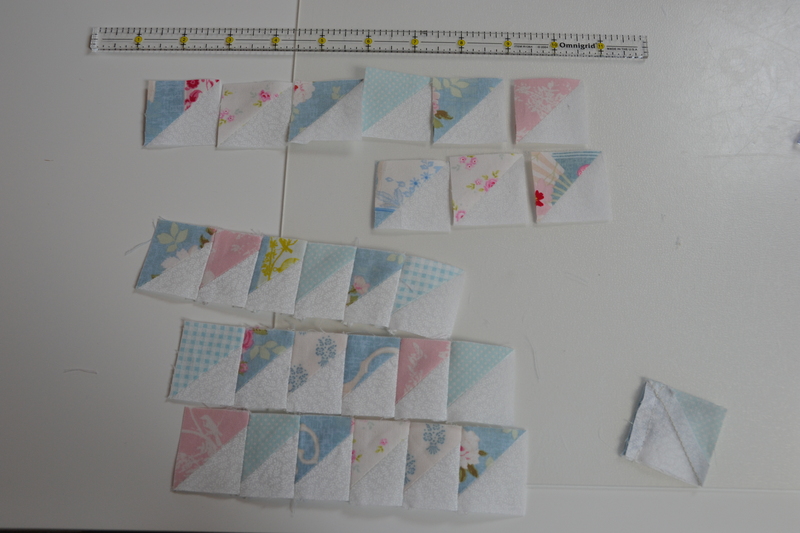 …and so I cut them down and made these cute little 1½ inch half-square triangles (HST) which I had cut and begun piecing the day before. 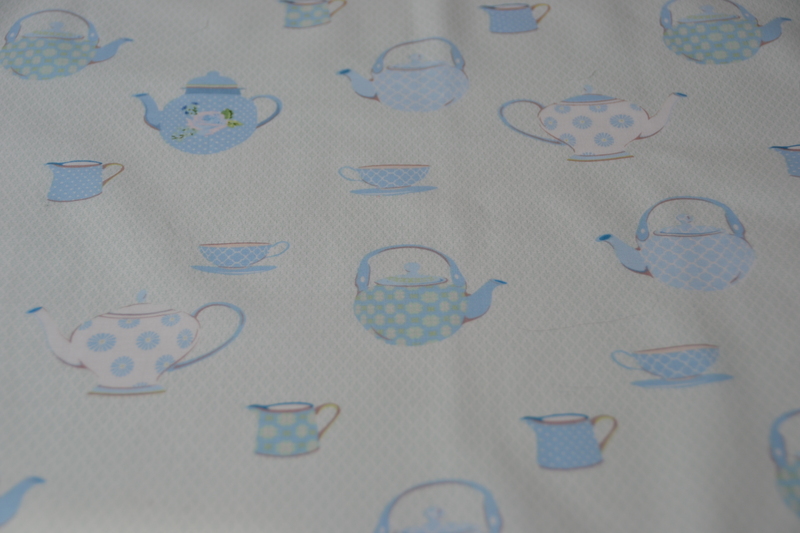 The fabric is from Tilda’s ‘Christmas Play’ collection. 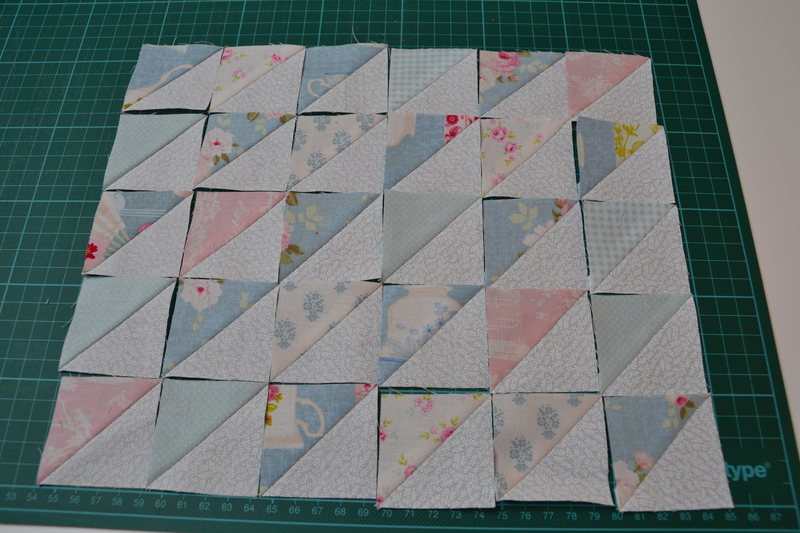 Unfortunately, I’ve really been having trouble, (as I did with quilt itself) sewing these tiny HST’s together. Not only do I have a major tension problem which I can’t seem to fix but the beginning of the material gets eaten by the machine and I can’t seem to keep the seam straight, which tends to veer off at the end despite having marked a seam line. I am trying to research my issues but if anyone has any pointers I would certainly appreciate them. I loved sharing my sewing space with someone who enjoys making pretty things as much as I do and having the opportunity to share each other’s creative plans and ideas. I would encourage anyone who hasn’t already had a sew date, to arrange one with any willing friends, neighbors or relatives. I hope you enjoyed this post! If you have any questions or comments, please leave a comment!